WILLEMSTAD - The cruise ship MV Viking Star of the cruise line Viking Ocean Cruises Ltd. visited Curaçao for the first time last Friday, October 26. During the so-called “inaugural call” stakeholders are invited by the Captain and his crew, through the ship agent, for a short ceremony where those present are given the opportunity to welcome the ship and to exchange plaques. In this specific case those forming part in the ceremony were the ship agent, Pérez y Cía Curaçao, together with the Minister of Finance, Mr. Kenneth Gijsbertha (in replacement of the Minister of Economic Development, Mr. Steven Martina, who was on a business trip), representatives of Curaçao Ports Authority, the Office of Tourism, the Chamber of Commerce and the Customs Department, whom exchanged plaques with the Captain. This cruise ship holds 930 passengers, who stay in one of their 465 spacious rooms and has 454 crew members. 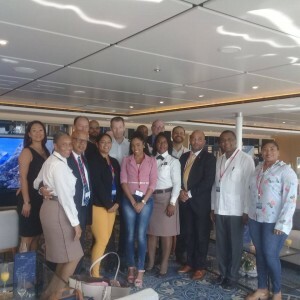 This time 815 passengers were on board of the ship that visited Curaçao. This means that for every two passengers one crew member is available to offer assistance and his or her services. The design of these ships is based on elegance and luxury. The ship MV Viking Star is the first ship of the cruise line Viking Ocean Cruises Ltd, which made her maiden voyage in April 2015. The ship has a length of 228 meter, with a tonnage of 47.800 GT and has 14 decks. What distinguishes the vessels of the Viking class from others, is the fact that they are known as “adults only vessels”, with a minimum age of 18 years for all passengers. No children or teenagers on board therefore. There’s also no casino on board and every port includes an excursion. Her two sister vessels, Viking Sea en Viking Sky, visited Curaçao last year in the month of November. On the photo the moment of exchange of plaques.